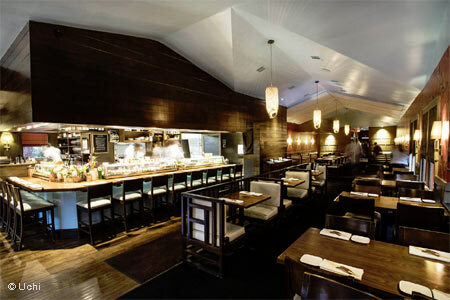 : Faithful sushi lovers migrate to this crimson-colored, cozy house for quality sushi and imaginative Japanese fusion fare. Chef Tyson Cole is challenged more than ever to live up to his reputation, and he rises to the occasion with every artfully arranged plate. Experience dishes such as his Alaskan king crab sashimi drizzled with vanilla oil and dotted with dried blueberries. Or opt for the cool toro nuta of silky bluefin with dried cranberries, Marcona almonds and white soy. We've found the freshwater eel, flounder, spicy scallop and anago sushi with orange and slivered ginger all to taste pristinely fresh. The “shag” roll, named after a loyal customer, has become known for its combination of salmon, avocado and sun-dried tomato wrapped in tempura, then garnished with a dramatic squid ink and sumiso sauce. Yakimono offerings are grilled over Japanese oak and may feature Norwegian mackerel with a spice trio or another selection that arrives fresh daily from the sea. Ask about the ever-changing multi-course tasting menu --- a must for the culinary-adventurous. A noteworthy wine list is punctuated by an impressive saké selection, and a knowledgeable staff will guide any novice toward appropriate choices.